You can find lots of non-genuine hoses on the market, and they can fit our equipment – but do they have the same specifications as genuine hoses? The answer is: No. From our experience, we have found many cases of unexpected failures caused by using non-genuine hoses. We therefore decided to test genuine and non-genuine hoses to see how they are different. The following are test results between genuine hoses and non-genuine hoses. For best results, Hitachi recommends that you use genuine hoses. Non-genuine hose breaking pressure is 40% to 50% lower than genuine hoses. 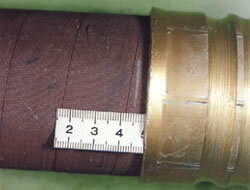 Genuine hose breaking phenomenon consisted of just oil leakage, while non-genuine hoses, had not only leakage but in some cases broken fittings, and disconnected fittings. 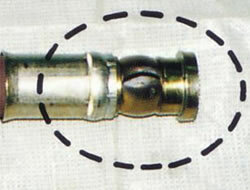 Non-genuine hoses break at 25% to 60% lower tension than genuine hoses. Non-genuine hoses start leaking and/or are broken at an 80% to 90% lower cycle than genuine hoses. Hitachi hoses must meet our strict specifications, but from test results, non-genuine hoses specifications are lower than Hitachi hoses. Hitachi would like to recommend that you use only genuine Hitachi hoses. This will reduce your total maintenance cost (less replacement), and also prevent injury, machine damage and environmental pollution.